Published: March 29, 2013 at 03:41 p.m. 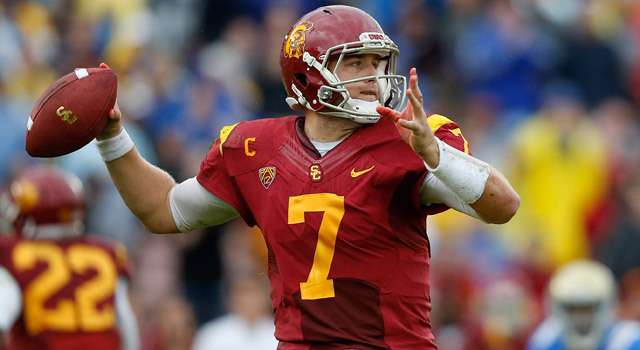 Updated: April 27, 2013 at 07:40 p.m.
USC quarterback Matt Barkley was selected No. 98 overall by the Philadelphia Eagles on Saturday. 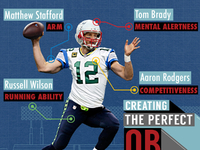 Has Philadelphia Eagles coach Chip Kelly found his quarterback of the future? The Eagles made the boldest move of Day 3 of the 2013 NFL Draft on Saturday, trading two picks to the Jacksonville Jaguars in order to select USC quarterback Matt Barkley at No. 98 overall. Philly has plenty of quarterbacks in its stable, and it'll be interesting to see how Barkley will fit in Kelly's fast-paced offense. The San Diego Chargers made a big trade on Day 2, sending two picks to the Arizona Cardinals in order to select Notre Dame linebacker Manti Te'o at No. 38 overall. 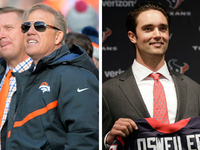 Of course, the Eagles and Chargers weren't the only NFL teams to trade their way to big names. 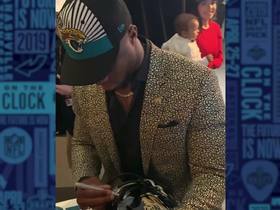 The biggest deal of the draft happened early Thursday, when the Miami Dolphins worked out a trade with the Oakland Raiders so they could select Oregon defensive end Dion Jordan at No. 3 overall. The St. Louis Rams also made a gutsy first-round move, sending four picks to the Buffalo Bills for two picks, one of which they used to acquire West Virginia wide receiver Tavon Austin at No. 8 overall. Analysis: After acquiring overall pick No. 229 from the Patriots in the LeGarrette Blount trade, the Buccaneers traded it and a sixth-round selection to the Minnesota Vikings in order to move up and draft Miami running back Mike James. Analysis: The Patriots were expected to move kick return specialist Jeff Demps, so it makes sense they would trade him for more help at running back. The Patriots sent Demps and a seventh-round pick to the Buccaneers for running back LeGarrette Blount. Around the League's Gregg Rosenthal writes: "This is a trade that includes two interesting names, but really shouldn't make much of an impact." Analysis: The Texans traded two picks, including one they received from the Rams less than an hour earlier, to the Raiders in order to draft San Jose State offensive tackle David Quessenberry. Analysis: The Rams sent the Texans two late-round picks in order to select Vanderbilt running back Zac Stacy in the fifth round of the 2013 NFL Draft. Analysis: Stansly Maponga was selected in the fifth round by the Falcons, who traded two picks to the Bears in order to draft the Texas Christian defensive end. Analysis: The Colts traded a fourth-round selection in the 2014 NFL Draft in order to select Tennessee-Martin defensive tackle Montori Hughes in the fifth round. Analysis: The Seahawks traded two picks to the Lions to get Alabama defensive tackle Jesse Williams. Analysis: The Packers traded up to select another high-profile running back, taking UCLA's Johnathan Franklin. The Packers drafted Alabama running back Eddie Lacy at No. 61 overall Friday. NFL Network analyst Charles Davis liked the move by the Packers: "I think this is a big-time value pick. Johnathan Franklin plays bigger than what you think. He's compact, but he'll run inside the tackles. His problem in the past: Putting the ball on the ground." Analysis: Syracuse safety Shamarko Thomas is heading to the Steelers after Pittsburgh agreed to send a 2014 third-round pick to the Browns. NFL Network draft analyst Mike Mayock on Thomas: "I love this kid. You talk about Steelers picking tough guys. This guy reminds me of Bob Sanders. He's undersized but plays like a human missile." Analysis: The Giants drafted Syracuse quarterback Ryan Nassib after sending a pair of picks to the Cardinals. NFL Network draft analyst Mike Mayock's reaction on Nassib going to the Giants: "He's a passionate kid with an edge. He's got some footwork issues, but if you want to talk about a kid with an edge to him who will make his teammates better, this is the kid. He's a tough kid. He lives in the weight room." Analysis: The Buccaneers move up in the fourth round of the 2013 NFL Draft, acquiring Illinois defensive tackle Akeem Spence after sending two picks to the Raiders. NFL Network draft analyst Mike Mayock on Spence: "He's got a lot of talent and a lot of size. He tested well for his size. He's as strong as they come." The Raiders added to their backup quarterback competition by drafting Tyler Wilson with one of the picks they acquired. Analysis: It appears Eagles coach Chip Kelly liked what he saw from Matt Barkley during his coaching stint at Oregon because Philadelphia traded up to acquire the USC quarterback in the fourth round of the NFL draft. 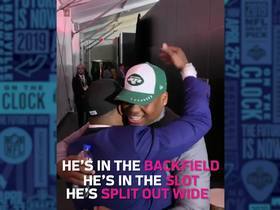 NFL.com's Albert Breer told NFL Network that the Eagles made the move to get Barkley since they believed the Chiefs were planning to select the quarterback at No. 99 overall. Analysis: The Dolphins continued to make moves in the third round of the 2013 NFL Draft, sending three picks to the Packers in order to select Utah State cornerback Will Davis at No. 93 overall. 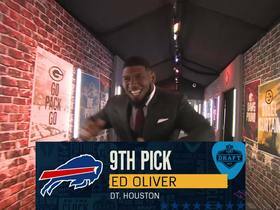 NFL Network draft analyst Mike Mayock didn't see Davis going in the third round: "I had a fifth-round grade on Davis. But he's a man corner with good ball skills. He'll be physical." Analysis: The 49ers went after a pass rusher in the third round, drafting Auburn defensive end Corey Lemonier at No. 88 after trading two picks to the Packers. NFL Network draft analyst Mike Mayock likes what Lemonier could provide the Niners: "Fits what they do. Kind of a somewhat conflicted pick in the sense that his talent would be a late-first to late-second round." Analysis: The Saints selected Georgia defensive tackle John Jenkins with the No. 82 overall pick after sending two fourth-round picks to the Dolphins. One of those fourth-round picks came from the Saints trading Chris Ivory to the Jets. Ivory had been on the Jets' radar for weeks, but New York did not sign him to a restricted free-agent offer sheet. Analysis: The Jets acquired running back Chris Ivory from the Saints in exchange for a fourth-round pick, which the Saints immediately traded to the Dolphins. Around the League's Dan Hanzus writes: "Ivory enters a Jets backfield in transition following the departure of Shonn Greene to the Tennessee Titans in free agency. Mike Goodson was signed to a three-year deal in March. We suspect Ivory will have the inside track at being the primary back at the Meadowlands." Analysis: The Browns boosted their receiving corps by adding Davone Bess from the Dolphins in exchange for two later-round picks. Analysis: The Ravens selected Kansas State inside linebacker Arthur Brown with the No. 56 overall pick after trading for the selection with the Seahawks. NFL Network draft analyst Mike Mayock likes the move: "Really fits a need for the Ravens. I believe positional versatility is what Arthur Brown brings to the table. I think he can play inside or outside. He's very good in pass coverage." Analysis: The 49ers moved up six picks in the second round by shipping two 2013 selections to the Packers. Rice's Vance McDonald is considered one of the top tight ends available in the draft. Analysis: The Chargers sent two draft picks to the Cardinals to get Notre Dame linebacker Manti Te'o at No. 38 overall. The Heisman Trophy finalist is considered by many as one of the top linebackers available in the 2013 NFL Draft class, but a controversy involving his personal life hurt his draft stock. With veteran Takeo Spikes now gone, it appears the Chargers are hoping Te'o can give the team a strong presence in the middle of the defense. Analysis:The Titans traded three picks to the 49ers in order to draft Tennessee wide receiver Justin Hunter at No. 34 overall. NFL Network draft analyst Mike Mayock's take on Hunter: "A lot of people had a first-round grade on this kid. He can make immediate production outside the numbers and in the red zone. The questions are drops and physicality." Analysis:The Vikings made a big move near the end of the first round, sending four 2013 picks to the Patriots in order to draft Tennessee standout wide receiver Cordarrelle Patterson. The move helps soften the absence of receiver Percy Harvin, who was traded to the Seattle Seahawks in March. The Vikings are the first team with three first-round selections since the St. Louis Rams in 2001. Analysis: The Falcons add to their secondary corps with one of the best available cornerbacks in Desmond Trufant. Atlanta traded three of its 2013 draft picks to the Rams to acquire the Washington standout, who is known for his playmaking ability and foot quickness. 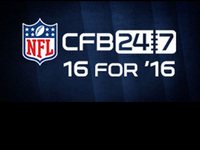 "I believe playing in Atlanta you're going to see this kid flourish," NFL Network draft analyst Mike Mayock said. The Rams selected Georgia inside linebacker Alec Ogletree with the first-round pick they received. Analysis: The Niners traded first- and third-round picks to acquire Reid with the No. 18 overall pick. Mayock's take on Reid: "With Dashon Goldson gone, there's nobody to step in and play. This kid is a big, physical safety with great movement skills. He will be a wonderful complement to Donte Whitner." The Cowboys took Wisconsin center Travis Frederick with the first-round selection they received from the Niners. Mayock had pegged Frederick as a third-round talent. Analysis: The Rams made quarterback Sam Bradford happy, trading up to acquire West Virginia's Tavon Austin with the No. 8 overall pick. The Bills received four picks in the trade and drafted Florida State's EJ Manuel with the No. 16 overall pick they acquired from the Rams. Manuel was the first quarterback selected in the draft and the only one taken in the first round. Analysis: The Dolphins traded two picks in the 2013 NFL Draft to acquire Oregon defensive end Dion Jordan, who is considered one of the top available pass rushers. The trade was anticipated on the Raiders' part, since the team was eager to acquire more early-round talent as they continue to rebuild their roster. The Raiders later nabbed Houston cornerback D.J. 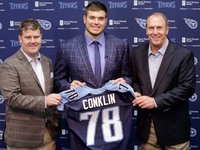 Hayden with the first-round pick they received from the Dolphins. Analysis: Chris Wesseling writes: "Bucs general manager Mark Dominik comes out smelling like a rose. He surrendered just two draft picks instead of the expected three for Revis. With no guarantees included in the contract, it's essentially a year-to-year situation. The Bucs are off the hook if Revis' knee prevents him from returning to shutdown-corner status." For the third consecutive year, the Jets drafted a defensive tackle in the first round, selecting Missouri's Sheldon Richardson with the No. 13 overall pick. Analysis: Gregg Rosenthal writes: "In McCoy, the 49ers get a young backup quarterback with 21 games of starting experience. The Texas product looked promising as a rookie, averaging 7.1 yards per attempt. In theory, he has the mobility to run whatever coach Jim Harbaugh wants in case of emergency." Analysis: Coach Bruce Arians and the Cardinals find the starting quarterback they need by giving Carson Palmer a pay cut over his previous contract with the Raiders. Gregg Rosenthal writes: "For all the slings and arrows sent at Palmer in Oakland, he threw for more than 5,000 yards in his first 16 games as a Raider. Palmer represents a clear upgrade on the Cardinals from their options last season." Analysis: Gregg Rosenthal writes: "In short, the Bucs were ready to cut Benn, a second-round pick in 2010. All the Bucs got was a move up from the seventh round to the sixth round. We suspect that a conditional pick is low, and dependent on Benn producing solid numbers in 2013." Analysis: Chris Wesseling writes: "Playoff hero or no, Baltimore Ravens general manager Ozzie Newsome did well to collect a draft pick for a player about to enter the declining phase of his career. Boldin wasn't going to see his $6 million salary, in which case the Ravens would have simply released him. From the San Francisco 49ers' point of view, Boldin fills a major need for a reliable receiver opposite Michael Crabtree while casting doubt on Mario Manningham's future in San Francisco." Analysis: The Seahawks strengthen their receiving corps with Harvin, who was unhappy playing in Minnesota. According to Gregg Rosenthal, the Harvin trade is a gamble that should pay off for the Seahawks in the end. The Vikings selected Florida State cornerback Xavier Rhodes with the first-round selection they received in the trade. Analysis: Gregg Rosenthal writes: "With his smarts and his underrated mobility, Smith makes a lot of sense as an Andy Reid-style quarterback. He can help the Chiefs compete right away because the team has talent on defense and some pieces in place offensively like Jamaal Charles, Jon Baldwin and possibly Dwayne Bowe, who sounds likely to get the franchise tag. The downside for Smith: He doesn't have 49ers coach Jim Harbaugh to guide him anymore."